The Year 11 syllabus is divided into two units, each of one semester duration, which are typically delivered as a pair. The notional time for each is 55 class contact hours. Unit 1 begins with a review of the basic algebraic concepts and techniques required for a successful introduction to the study of functions and calculus. Simple relationships between variable quantities are reviewed, and these are used to introduce key concepts of a function and its graph. The study of probability and statistics begins this unit with a review of the fundamentals of probability, and the introduction of the concepts of conditional probability and independence. The study of the trigonometric functions begins with a consideration of the unit circle using degrees and the trigonometry of triangles and its application. Radian measure is introduced, and the graphs of the trigonometric functions are examined and their application in a wide range of settings are explored. 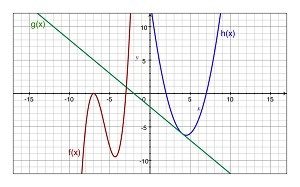 In Unit 2, exponential functions are introduced and their properties and graphs examined. Arithmetic and geometric sequences and their applications are introduced and their recursive definitions applied. Rates and average rates of change are introduced and this is followed by the key concept of the derivative as an “instantaneous rate of change”. These concepts are reinforced numerically (by calculating difference quotients), geometrically (as slopes of chords and tangents), and algebraically. The first calculus topic concludes with derivatives of polynomial functions, using simple applications of the derivative to sketch curves, calculate slopes and equations of tangents, determine instantaneous velocities, and solve optimisation problems. Note - A detailed assessment statement will be provided to students at the commencement of the course. The major themes of the Mathematics Method ATAR course are calculus and statistics. They are developed systematically, with increasing levels of sophistication and complexity. This course provides a foundation for further studies in disciplines in which mathematics and statistics have important roles. It is also advantageous for further studies in the health and social sciences. This course is designed for students whose future pathways may involve mathematics and statistics and their applications in a range of disciplines at the tertiary level.